Central Texas is growing rapidly and Guadalupe County is no exception. It’s no wonder that people are being pulled to this beautiful place. From Seguin, the watermelon capital of the world, to the relaxing atmosphere of Lake McQueeny, Guadalupe County has something for everyone. Whether you want to develop one of the vast farmlands, a gorgeous lakefront property or anything else available in Guadalupe County, we at Graham Construction & Land Clearing are here to help you. While the diverse landscape makes it hard for any developer lacking a thorough knowledge of the local land to handle your construction needs, with Graham Construction & Land Clearing, you don’t have to worry. We’ve been serving Guadalupe County and surrounding areas for years and have a wealth of experience that make us the reliable team that can tackle your project, whether it’s a large scale commercial development or you want the work done for residential needs. It takes a lot of work to clear land once, let alone multiple times- which is a risk you run if your land clearing isn’t done properly from the beginning. We are well acquainted with the range of flora found in Guadalupe County, and we have the tools and knowledge to remove it for you. If you need further assistance with various types of site work after land clearing, we’re the team for the job. Need underground utility contractors and excavating contractors? No problem. We can also grade the land to prevent potential water issues or do a complete septic installation. 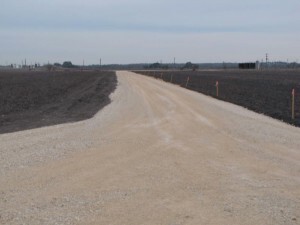 If you need roads built or have another project in mind, big or small, we’ll help you get it done. We’ve been doing site work projects and septic installations for years. Metal buildings are useful for many things, including storing equipment, providing protection from harsh Texas weather, keeping a great space for social activities, or to increase the value of your property, making it more appealing to buyers and investors. We can customize any metal buildings you may need for any purpose. Farmland, lakefront property, ranch or other and all land styles in Guadalupe County can benefit from fencing. Ranch fencing is the perfect way to mark your property lines, and we have a wide range of styles to choose from. We will install gates for aesthetics or function, cattle guards- anything you might need to improve your property. Hunting is popular in Guadalupe County but it takes a little more than a weekend off to be able to enjoy the sport. When it comes to game-proof systems, food plots, watering systems and other developments and services in wildlife management that will enhance your recreational enjoyment, we’ve got you covered. The future of Guadalupe County looks bright. It’s hard, almost impossible, however, to maintain and improve a property on your own. We at Graham Construction & Land Clearing understand the importance of working with specialists who not only know how to get the job done, but will do it quickly and in a dependable manner. That’s why we take the time to work with each customer to understand their needs in order to provide them with best service possible. Whatever your project may be, from septic installation, ranch fencing, metal building installation, land clearing or any other type of sitework, we want to help you. Trying to find capable excavating contractors and underground utility contractors? Look no further. Contact us today whether you are a private homeowner or commercial developer, and let’s get started on your property improvement projects together.